• Foster the exchange of information between the professional and the avocational archaeologists. The chapter’s first meeting was held Aug. 12, 1955, at the James V. Brown Library in Williamsport. 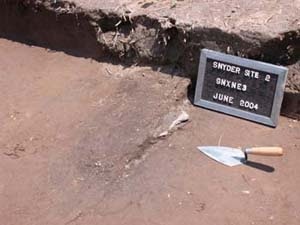 The Society for Pennsylvania Archaeology, Inc. was organized in 1929 to: Promote the study of the prehistoric and historic archaeological resources of Pennsylvania and neighboring states; Encourage scientific research and discourage exploration which is unscientific or irresponsible in intent or practice; Promote the conservation of archaeological sites, artifacts, and information; Encourage the establishment and maintenance of sources of archaeological information such as museums, societies, and educational programs; Promote the dissemination of archaeological knowledge by means of publications and forums; Foster the exchange of information between the professional and the avocational archaeologists. Andaste Chapter #5 Currently inactive. Paul R. Stewart Chapter #19 Currently inactive. Somerset County Archaeology Society Chapter #20 Currently inactive. The name of this organization shall be the North Central Chapter No. 8 of the Society for Pennsylvania Archaeology. (a) The study of the Archaeology of Pennsylvania, principally the North-Central area. (b) The careful preservation and cataloguing of all archaeological sites and artifacts. (c) The encouragement of the spreading of archaeological knowledge through educational programs. (d) The insistence that all members make an honest effort to study the scientific approach to archaeological methods. (e) To act in cooperation with the Pennsylvania Archaeological Society, local historical societies, etc., and render any aid possible. The membership shall consist of five classes: Life, Individual, Student, Family, Business/Organization, and Honorary. Anyone may become a member upon application and payment of dues as stipulated by the general membership. The only other requirement shall be an honest interest in archaeology. Life membership may be obtained upon application and payment of stipulated dues. Individual membership is open to all who are 18 years and older and hold the objectives of the society. Student membership shall have all the rights of an active individual membership except the right to vote until the age of 16. College students may join as student members. Family membership may be obtained upon application and payment of stipulated dues. Honorary membership shall, at all times, be limited to ten. To hold office in the chapter, one must also be a member of the State Society. Membership in the chapter shall terminate under either of the following conditions. (a) Non-payment of dues for one year. Re-instatement shall become automatic upon payment of current dues. (b) By expulsion for causes: Written charges signed by at least five members may be brought against any member for action detrimental to the welfare of the chapter. Such charges shall be included in the notice of the next meeting, at which time the charges will be considered. A three-fourth majority shall be required for expulsion. Re-instatement can be obtained in a like manner at any subsequent meeting, notice of this appeal having been included in the announcement of such meeting to all members. The officers shall consist of a president, elected for a term of two years; two vice-presidents, also elected for a two year term, and a secretary-treasurer or a secretary and a treasurer, also elected for a two year term. Directors shall be elected to terms of two years each. These officers shall constitute the executive board. The immediate past president will automatically become a director and shall continue to serve until succeeded by the next ex-president. New officers will take office at the January meeting. President: Shall preside at meetings and conduct the business of the Chapter, assign committees and duties to members when needed. 1st Vice President: Takes direction from the president and does the duties the president assigns. 2nd Vice President: Takes direction from the president and does the duties the president assigns. Secretary - Treasurer: The secretary-treasurer shall present written reports at the meetings and archive minutes, shall maintain membership records as accurately as possible, shall prepare and send out yearly membership notices and maintain financial records. Directors: shall serve on the Chapter Board and be advisors overseeing the business of the Chapter and be responsible for policy making. The administration of the chapter shall be entrusted to the executive board, subject to instruction and ratification of their acts by the chapter at a regular meeting. All officers shall serve from the close of the electoral meeting until their successors are installed. Two months before the electoral meeting, but not less than one month, the president shall appoint a nominating committee to prepare a slate of nominations for the open offices for the ensuing year. The chairman of the nominating committee shall advise the secretary of these nominations, and the secretary will send the slate to all members not less than fifteen days before the electoral meeting. Additional nominations may be made from the floor. In case of competition for any office, voting at the meeting will be by secret ballot. If a vacancy should occur on the executive board for any reason, the remaining members will have the authority to fill such vacancy until the next election. Meetings shall be held at such times and places as the executive board shall designate, at which time, reports of committees, officers, secretary-treasurer and the executive board shall be given, and the business of the chapter transacted. The members present shall constitute a quorum. Notice of all meetings shall be sent to all members one week in advance. Meetings of the executive board may be called at the discretion of the president or at the request of any member of the executive board. Any four members of the executive board shall constitute a quorum of that board. Special meetings may be called by the president, with the approval and consent of the executive board. All meetings will be governed by Robert's Rules of Order. The fiscal year will run from January 1 to December 31. Dues will become delinquent March 1st. Dues notice shall have been sent to members involved during the preceding three months. Members who are six months in arrears shall not be entitled to vote or hold office. Members who are one year in arrears shall, after formal notification, be removed from the roll. Officers who have not paid their dues on or before March 1st may not continue in that office. Orders may be drawn upon the treasurer for the payment of valid existing obligations of the chapter. They shall be signed by the treasurer and the president. Such orders shall be sufficient warrant for the disbursement of the amount specified by the treasurer. The treasurer shall take proper receipt or voucher for same. Financial statement shall be made annually, at the end of the fiscal year. The auditing committee shall be appointed by the president at the end of the fiscal year and their report presented to the chapter at the following meeting. General funds shall be invested in the name of the chapter and countersigned by the secretary-treasurer (Current), only one signature necessary for the issuance of checks. Transfer of account may be effected by the executive board, for the convenience of the newly elected officers. Proposed amendments to this constitution shall be submitted to the executive board in writing, signed by not less than four members. The executive board shall then direct the secretary to submit the proposed amendment to the members, together with approval or disapproval of the board, at least fifteen days before the next meeting, at which time it shall be voted upon. If approved by the executive board, a majority vote will suffice. If disapproved, a two-thirds vote shall be required for adoption. The provisions of this constitution, as revised upon _February 6 of 2012 shall take effect immediately.